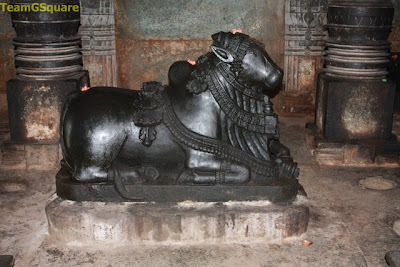 Sindaghatta houses another Hoysala temple apart from the Lakshminarayana Temple, dedicated to Lord Shiva. This is the "Sangameshwara - Jangameshwara Temple". This temple is different from the dwikuta structure, usually found facing each other. Here, the two structures are adjacent to each other, similar to the Harihareshwara Temple of Hariharapura. The temple is east facing and built on a raised platform. It has two separate entrances, two separate Garbhagrihas, two separate antaralas and a common Navaranga. The door frames are heavily carved. Though the external features of the temple look simple, its internal features are intricate and heavily decorated. The Hoysala Emblem depicts a man killing a tiger, and apparently the tiger was an emblem of their rivals, the Cholas at that time. May be they were code words as in the current military operations and may be the word Hoysala/ Poysala probably meant 'Destroy the Cholas'. 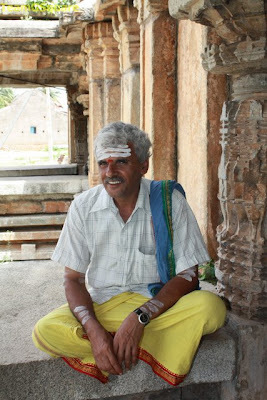 The priest of this temple was a very kind and knowledgeable man. He quoted a few lesser known facts and stories from the Ramayana and the Mahabharata. He also enlightened us about Dwarka, the capital city of Lord Krishna found under water near the coast of Gujarat. The temple has been renovated by the Government with the help of Shri Manjunatha Trust of Dhramasthala and the locals, though it definitely requires further maintenance. Directions from Bangalore: Bangalore - Mysore road - B.R.Koppal - Right turn - Pandavapura - K R Pete - Right Turn - After 7 kms turn Left - Sindaghatta. 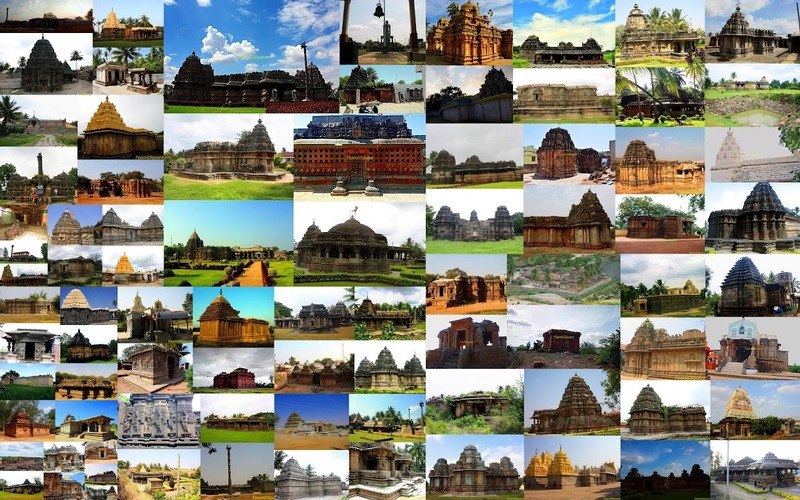 Places to visit near by: Hariharapura, Akkihebbalu, Varahanatha Kalahalli, Kikkeri, Govindanahalli, Hosaholalu, Sheelanere and many more. Typical Hoisala architecture.. Nice coverage TGS..You seem to be taking us to the nook and corner of your part of the country.. thanks..! Exquisite place. 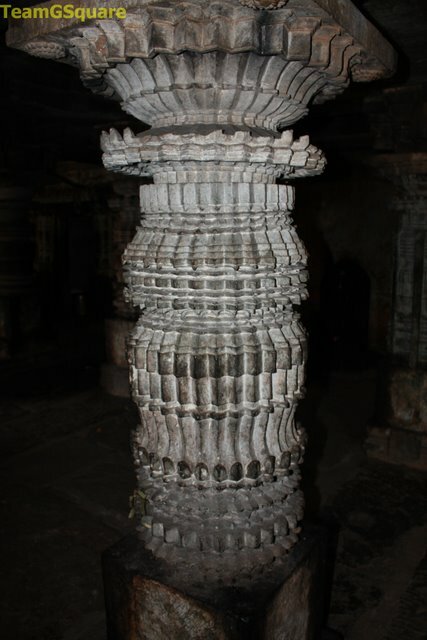 What a pillar, what carvings. Absolutely magical. Lovely temple. 2 entrances from front with common navaranga is very unique. Thanks for the post. I'm always fascinated not only by your wonderful photos, but intriguing history that you include! As I've said many times, I do so enjoy learning about your country and culture as it is so very different from mine. Thank you for sharing, not only the history, but your marvelous photos! I hope your week is going well! nice one and the door looks so beautiful! Beautiful architecture, your blog shows the India we all are so proud of. Thanks for sharing and bringing us close to our heritage and culture. Another marvel by the Hoysalas... Will plan a visit to this place soon..
Beautiful place. One more to my must see list. Segui passos e encontrei este blog. As always your post and photos are fascinating. I love the pillar, ceiling, the Nandi figure and the priest the best. The priest is so colorful, the Nandi figure is beautiful. The structures and ceiling of Hoyasala temples have lot of similarity. I loved the pic. of Nandikeshwara. The stone is smooth and gleaming. The pillar, ceiling and nandis are wonderful. It is good to know that the temple is still being used for worship unlike many that have become ruins. Nice to know a destination near Bangalore! Thanks for sharing. Nice posts, gives an idea what to expect. I visited this in analog era, a visit is due. Interesting dual temple. I do most of my travel on job. Next time I will dig into your blog. love the job ur doing.keep going! wonderful pictures.... particularly the pillar is so good.... the nandi picture is also great... a good post, portraying a different temple!! !